Nowadays, businesses have to cater to the needs of their international customers by translating websites, software, e-commerce, and even social media. How do you do that? Of course, you can apply the do-it-yourself approach and translate your content in-house, with the help of your multilingual colleagues. You can also hire a professional translator for more complex translation projects. Which option is the best for you and how does professional translation exactly work at Text United? Today, we will answer these questions. Customers using our free plan can still order professional translation and outsource their work to Text United. Our team of Project Managers will handle the projects from start to finish. For subscribed users, Text United additionally unlocks a variety of features for in-house translation. This includes team management, project management tools and a CAT tool for your in-house translators. Of course, there’s no limit when it comes to outsourcing projects to our professional translators, who offer the highest quality translation. The second one is machine translation and human review. This is a slightly lower quality translation, which also costs less. The content submitted by users is pre-translated with machine translation and reviewed by a professional translator afterward. How do we choose the best translator for your project? Let’s say that you decide to outsource the translation to us. What happens next? Of course, we need to find the best translator for your business’ needs. However, before we even choose the best translator for your project, translators must undergo a complex process in which there are multiple factors involved. Dedication: are they flexible to work overtime if necessary? Are they are willing to make additional changes if necessary? Experience in a particular field of expertise is one of the major things we look for which will guarantee high-quality translation. Before the translators start working with Text United, they do a translation test (an example translation project) to show their skills. If all requirements are met, the translator needs to sign an NDA Agreement and Statement Regarding Business Classification – which guarantees the protection of sensitive information provided by our clients. 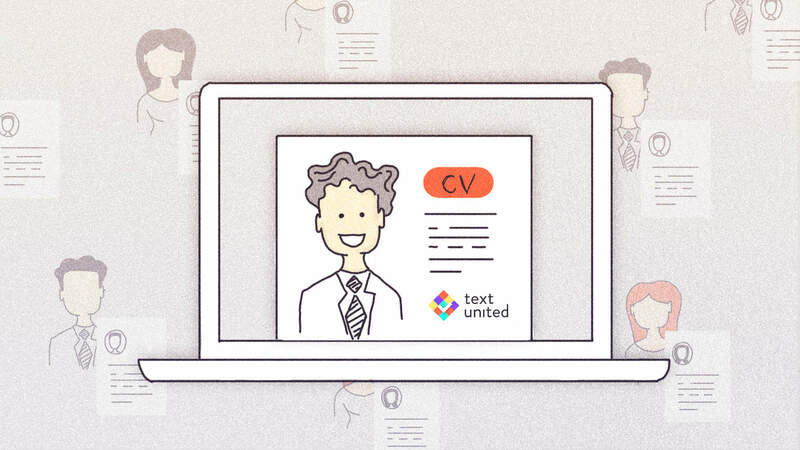 Once you order any of the type of professional translation at Text United, our project managers receive notifications and start working on the project. Only when you accept an offer made by a project manager, translators can start to work on the project. Of course, the project manager is monitoring the project, available for any additional requests for the clients. When the translation process is complete the project manager generates a QA report to check for translation consistency and terminology use. Once the translation and final check are done, our project managers will deliver the files back to you and you can enjoy your brand new global website, software or e-commerce! We hope that after reading this blog post, you fully understand the process of ordering professional translation at Text United and you know on what basis we hire our professional translators, providing you with the best quality translation. If you want to try out our system and see the quality for yourself, don’t hesitate to register for a free trial!